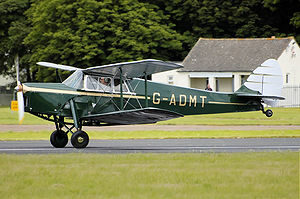 The de Havilland DH.87 Hornet Moth was a single-engined cabin biplane designed by the de Havilland Aircraft Company in 1934 as a potential replacement for its highly successful de Havilland Tiger Moth trainer. Although its side-by-side two-seat cabin made it closer in configuration to the modern aircraft that military trainee pilots would later fly, there was no interest from the RAF and the aircraft was put into production for private buyers. The prototype first flew at Hatfield on 9 May 1934 and, with two other pre-production aircraft, embarked on an extensive test program that resulted in the first production aircraft (designated DH.87As) completed in August 1935 having wings of greater outboard taper. These were found to cause problems, especially when landing in three-point attitude: there was a tendency for the tips to stall, causing embarrassment to the pilot and often damage to the aeroplane. 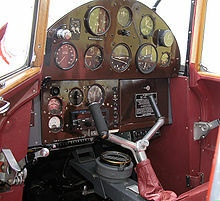 From early 1936 de Havilland offered owners of the DH.87A replacement wings of the new squarer shape at a reduced price in exchange for the original wings, while new aircraft built with the square wings (which reduced overall span by 8in/20cm) were designated DH.87Bs (from about Builder's Number 68). The alterations slightly increased overall weight at some penalty to performance. Production was 164 aircraft, of which 84 were placed on the British Register. Many were impressed for military service during World War II, mostly being used by the RAF as liaison aircraft. Small numbers survived the war and with time became highly prized by vintage aircraft enthusiasts. A small number are still flying over seventy years after production ceased. A Hornet Moth appears in Ken Follett's 2002 suspense novel Hornet Flight. It also appears in Jasper Fforde's 2005 mystery novel The Big Over Easy.